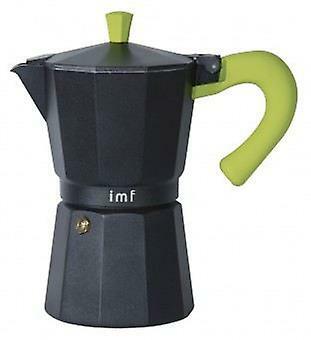 Made of molten black matte aluminum with bakelite heat-resistant coloured silicone touch knob and handle. - With filter and odorless silicone gasket. - Safety pressure valve. - Suitable for gas, electric and vitroceramic hobs. - Not dishwasher safe. DIMENSIONS: 9 cups.